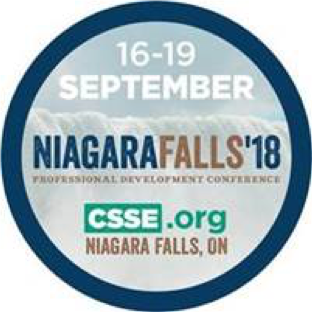 Incorporating Health & Safety into Sustainability at the 2018 CSSE PDC - Tavares Group Consulting Inc.
Tavares Group Consulting had the opportunity to exhibit at the Canadian Society of Safety Engineering (CSSE) 2018 Professional Development Conference (PDC) on September 16th-19th in Niagara Falls, Ontario. This 3-day event allowed for a wide range of speakers and workshops to engage participants over a variety of health and safety topics, an important Operating Practices metric identified by the StaarsoftTM sustainability software and its Sustainability Toolkit approach. 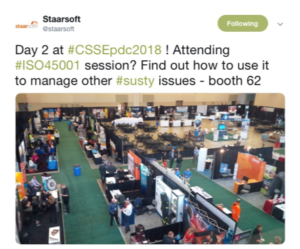 At this year’s PDC conference, Tavares Group Consulting was able to demonstrate the progression from the manual spreadsheet approach of the CSSE Safety Sustainability Project, to automated sustainability management and reporting via StaarsoftTM, both founded on the Sustainability Toolkit approach. StaarsoftTM guides organizations, step-by-step through the process of planning, implementing, and continually improving a comprehensive sustainability program. Workshops touched on what companies can expect from ISO 45001:2018 Occupational health and safety management systems, a framework which StaarsoftTM, has incorporated into its sustainability implementation approach. This management system can be utilized to manage other essential sustainability criteria aside from Operating Practices, including Environment, Community and Products & Services, along with their associated metrics. Why not expand your hazard risk assessment to include other sustainability issues? Sessions also covered safety metrics. The Sustainability Toolkit approach and the associated CSSE business case and implementation guide have identified sustainability, including Health & Safety, leading and lagging indicators which are critical to monitoring the sustainability performance of an organization. Leading and lagging indicators can assist with not only assessing ongoing/past issues but also help predict emerging priorities. With the introduction of the Sustainability Development Goals (SDG), health and safety most commonly falls under SDG#3 Good Health and Well-Being, but it can also contribute to many of the other SDGs – Tavares Group Consulting’s recently updated Sustainability Toolkit Guidance document to include the SDGs can show you how. how to respond and manage H&S supply chain requirements, call or email us today. Follow Tavares Group Consulting and StaarsoftTM for our next events and your chance for a free sustainability assessment!